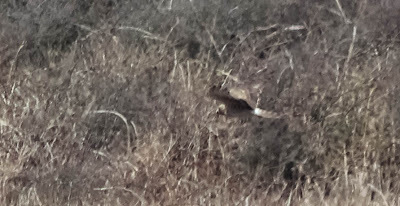 As we (Ed, Bee and Will) walked to the farm after lunch today we spotted two 'ringtail' harriers flying around together in North Valley and to cut a very long story short we have ended up with an incredible harrier double - Pallid and Montagu's Harriers. 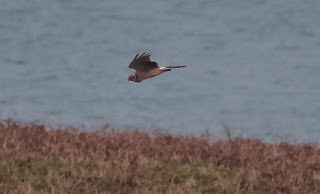 As previously mentioned our now long staying juvenile Pallid Harrier is a potential first for Wales and obviously incredibly rare, breeding no closer than Eastern and Northern Europe. The next rarest is the Montagu's Harrier which has the distinction of being Britains rarest raptor. So to have the two flying around together in a small area on an island not normally famed for it's rare raptors is quite incredible. Unfortunately the wind is in the north and the seas are big and there are no boats running out to the island (it's always the way) tomorrow. There should be boats out to the island on Sunday (28/04/13). The sun, however, shone all day and conditions were not too bad for the hunting harriers as they were both seen with full crops. 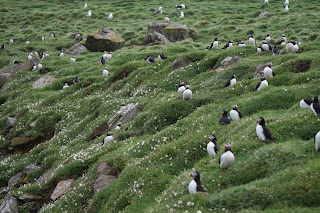 Today we counted the puffins again and although there were slightly less around and the weather was not perfect we still counted the astronomical figure of 17,228. 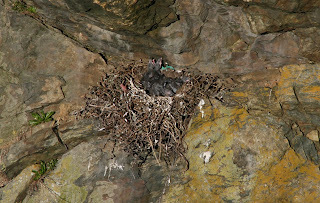 It is seems we have just hit the right period for counting: The puffins are not yet on eggs, it is a late season. Also noteworthy was the finding of a Short-eared Owl nest containing four eggs by James, our long-term volunteer, and the first sightings of Whitethroats and Swifts. 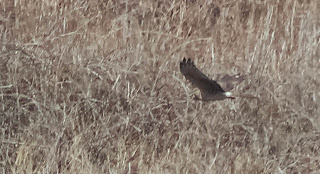 Unbelievably the Pallid Harrier was still around and obviously hunting successfully around North Valley and the Farm (see picture). Last week we heard about wrecked auks on the east coast, see the Skomer blog and the Blakeney Point blog There were over 1,100 Puffins, 318 Guillemots, 143 Razorbills (over 80 Razorbills found dead on Blakeney Point alone) and 3 Little Auks that succumbed to natural conditions in late March and early April along the east coast of Britain. There have also been fresh cases of birds (particularly auks) washing up on south coast beaches with Polyisobutylene clogging their feathers - see Skokholm blog. Colonies from many different areas could be effected by these two mortality events, between the west coast of Britain and Northern Europe. 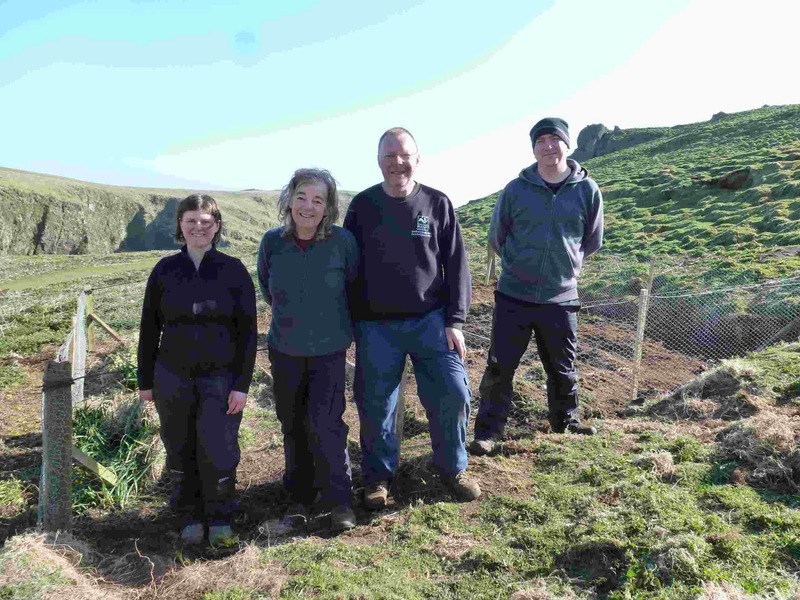 On Skomer, however, at least we can give some good news. On Saturday we did an all island Puffin count to try and ascertain the maximum number of Puffins using Skomer Island at any one time. This is one of the main ways in which we estimate our breeding population and it is important to do the count when the maximum number of birds are present around the island. We counted over 19,000 Puffins, many more than have ever been counted on Skomer before and we think that as well as some possible overcounting there is also an increase in the numbers of Puffins around Skomer. In any case there are plenty of Puffins coming close to Skomer this spring and this should be celebrated. 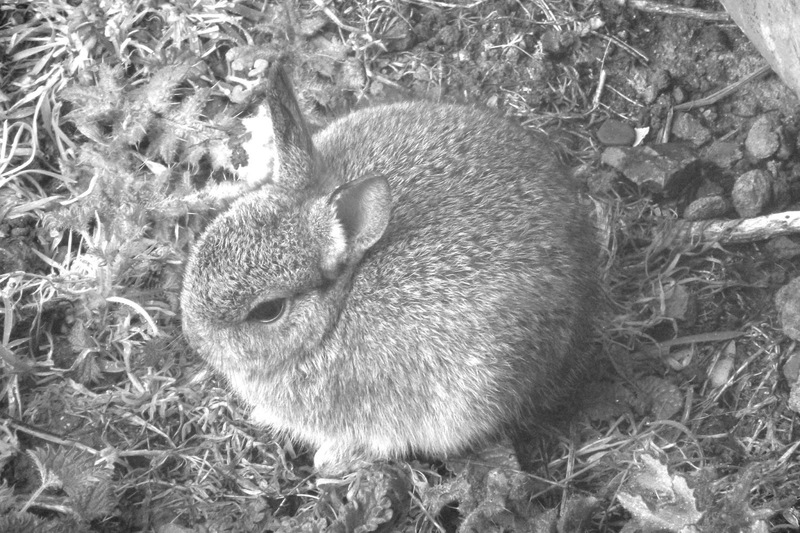 We will try another count as soon as the weather permits and hope to come up with an accurate estimate of individuals using the island soon...watch this space. 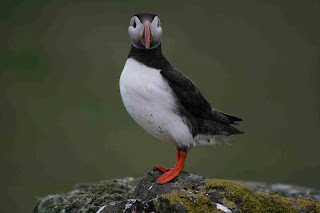 On another good note I realised today (I can be a bit slow sometimes) that an amazing coincidence took place as we moved from Norfolk to Skomer. 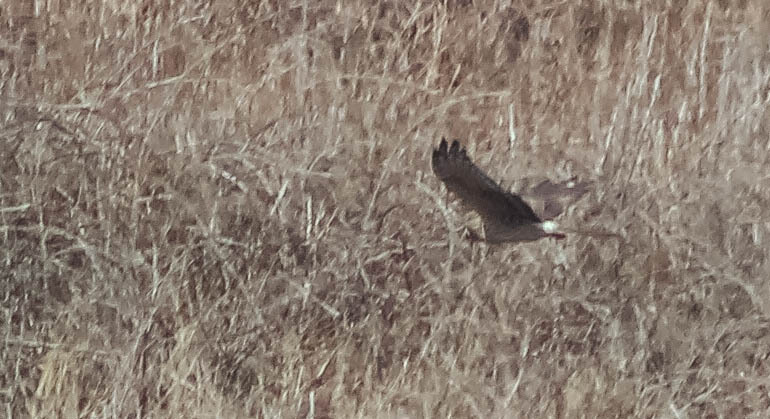 On my last day of work at Blakeney, which was the 8th of February, I spotted a wing tagged Marsh Harrier on Blakeney Fresh Marshes with green wing tags and the code AD. I rang the ringer (Phill Littler from the North West Norfolk Ringing Group), who told me that the bird had been ringed and tagged as a chick on Sculthorpe moor, Norfolk, in 2011 and that after visiting Sheppy Marshes in Kent it had spent the 2012/13 winter in Wales. It then flew back to Norfolk in February 2013 but amazingly then followed us from Norfolk to south west Wales in spring this year. The bird was seen and photographed on Marloes Mere - see Pembs Birds on the 4th of April. If confirmed this demonstrates an amazing back and forth movement of Marsh Harriers between east and west Britain and is extremely interesting. And so, to boot, on Saturday we had a first for Skomer, and possibly Wales, with a beautiful juvenile Pallid Harrier. These Steppe breeding birds are becoming more common as digital photography improves and as they move further to the west, breeding as close as Finland. Todays highlights: 3 Blackcaps, Sedge Warbler (first of the year), 7+ Willow Warblers, Chiffchaff, Common Redstart, 1+ Whimbrel. 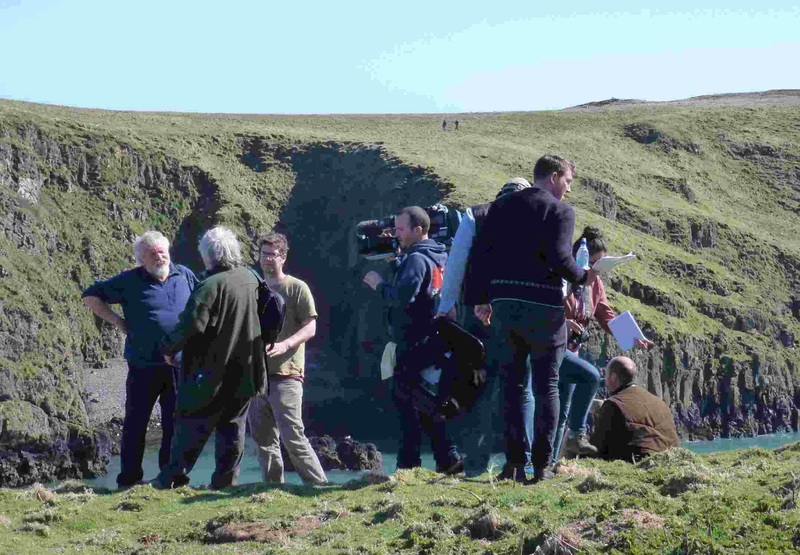 Usually when the Skomer crew speaks of B, B, and C they have things like butterflies, bumblebees and maybe Chough in mind but today the actual BBC came out to do a piece for “Britain’s Big Wildlife Revival”. 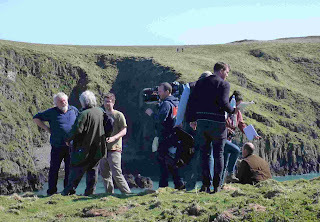 Bill Oddie was on board to film our lovely puffins which were very conspicuous by their absence. Well that’s life and what wildlife filming is all about. 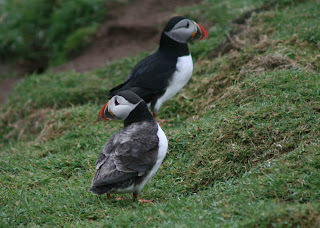 At least Bill took it with good nature and who knows maybe the puffins will show tomorrow. We had some more interesting guests today: The former warden Mike Alexander is visiting the island and he is an incredible source of information. He can tell you stories of foregone times that will transport you back in time. Life on Skomer between 1975 and 1985 was quite different: They had no computer and no phone but called the coastguards once a day to confirm that they were still alive. They kept chickens and goats and even survived the winter out here. They never knew whether visitors would be coming but had to scan the waters for the boat. Speaking of boats: They only had a dinghy with a tiny engine and on their arrival Mike carried his newlywed wife ceremoniously up the beach (they had to be married to get the job). Back to present times: Due to really strong winds we didn’t have many visitors this week but behold, we were not resting. We and especially our lovely volunteers got stuck into lots of maintenance work and we fenced the North Haven garden, sorted out the workshop, tidied up the garden and catalogued the library. A huge thank you goes again to our volunteers. On a day with slightly more moderate winds than predicted and a bit of sunshine, boats were able to run out to the island at 10:00 and 12:00 and we received 33 day trippers and two over night guests.Things were a bit quite on the bird front but there were some Puffins rafting and coming ashore in the afternoon and a few migrants in the bushes (and flying over (swallows)). 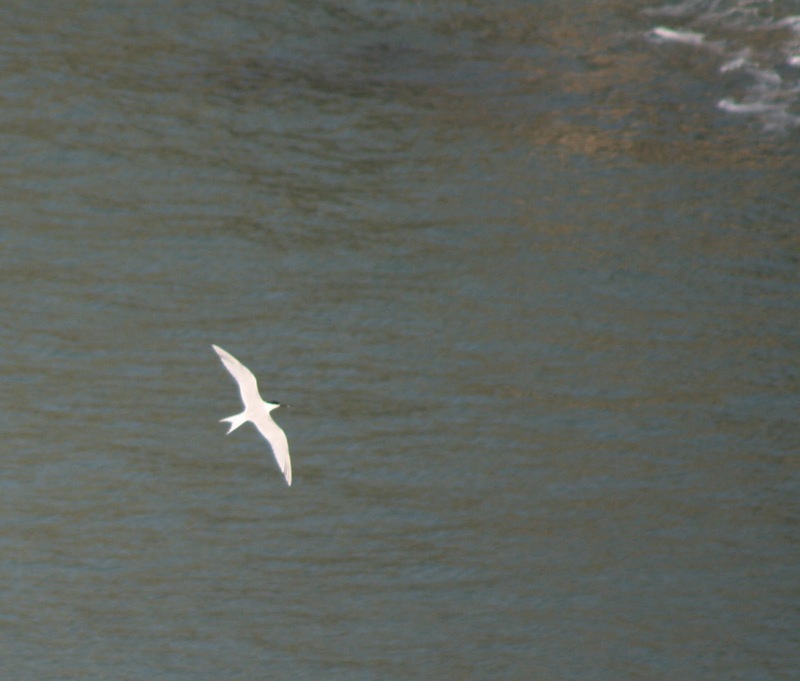 The highlight of my day however, was a Sandwich Tern which was spotted fishing in North Haven late in the afternoon. 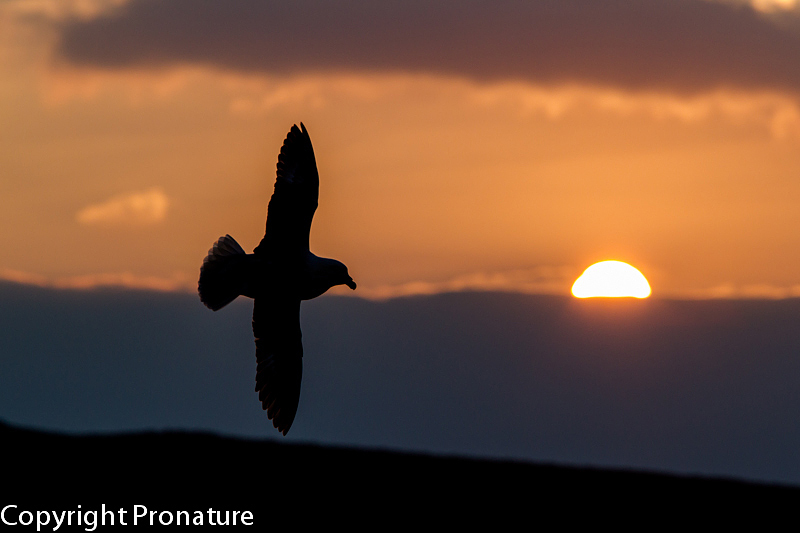 I arrived at Skomer in February from Blakeney Point in Norfolk, home to Britains largest Sandwich Tern colony. My last seven summers have been spent with these impressive terns and in a way it reminded me of home. Sandwich Terns spend the winter in the Mediterranean and in West Africa and this was the first that I had seen as well as the first record for Skomer this year. Another link between Blakeney Point and Skomer at the moment is the fact that there have been large wrecks of auks off the east coast, including many Puffins. Puffins are rarely seen off the Norfolk coast but wrecks of emaciated birds are sometimes recorded. This year has seen an unprecedented number washing up and the RSPB have said that it may be the worst wreck for half a century. 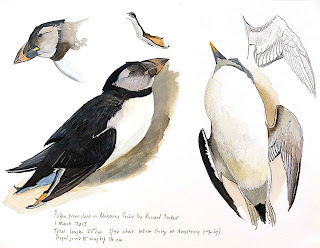 Martin Woodcock, an artist based in North Norfolk sketched one of the dead Puffins (still partially in winter plumage). Hopefully Skomer's Puffins will have a good breeding season this year to make good these east coast loses. Great Black-backed Gull - love them or hate them, the Great-blacked backed Gull is an impressive predatory bird. 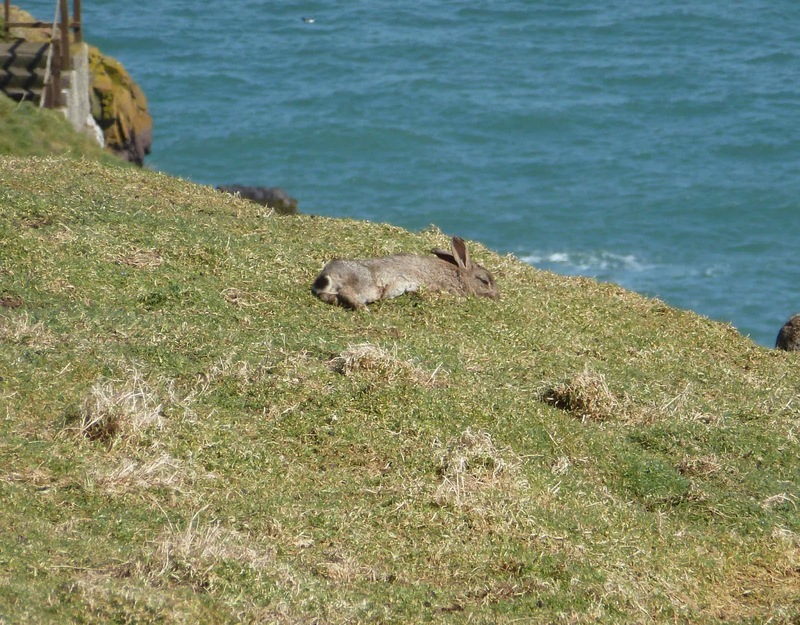 On Skomer they eat a lot of Rabbits. Now that the Manx Shearwaters, Puffins and other auks are back (most of the time) we are starting to populate the island with researchers, volunteers and overnight guests in order to track their breeding success and enjoy the island at its best. The weather is presently unsettled with strong winds and rain which is trying its best to scupper our plans. The forecast shows continuing south westerlies. We managed to do a change over between groups of volunteers this morning. 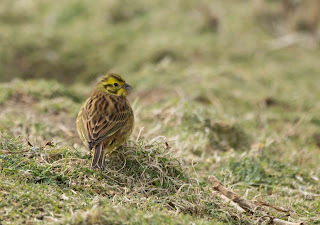 We thank last weeks group for their efforts and enthusiasm, especially Trini who was so pleased to be the only observer and photographer of the first Yellowhammer on Skomer for years. Our tractor is still not operational and we are hoping that the weather will allow the workmen and parts to come out next week to get it fixed. We have been using wheelbarrows and muscle power to get bags etc up to the farm which has been hugely benificial to the environment and our general fitness but we do need out tractor back to be able to launch our boat. The bad weather has however given us a bit of time indoors and we have been going through seabird research work and identifying small brown micro moths. 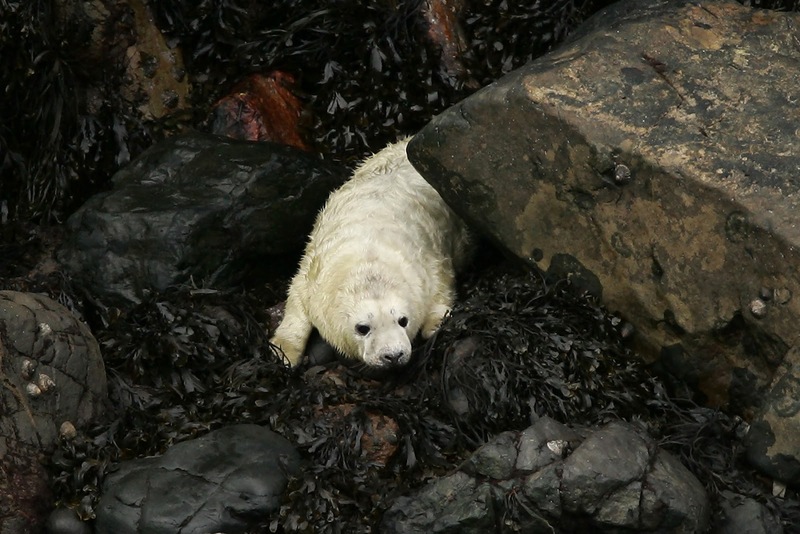 Yesterday saw two surprises: a white coat seal pup, no more than 10 days old and a Yellowhamer at the Wick which was the first since 2008. The poor pup is now sheltering in Driftwood Bay against the strong winds and rain. It is a long way off the main pupping season and these 'out of sync' pups are either eight months late or four months early. The puffins finally decided to come ashore today, having spent the day rafting around the island at around six o clock they started to land and by seven there were thousands of birds ashore. It's lovely to have them back and they should be coming ashore on calm evenings for the next couple of weeks. 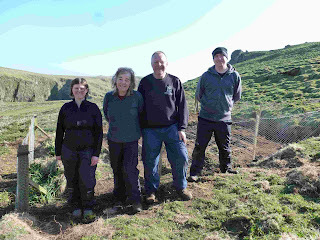 The 2013 season kicked off over the Easter weekend with our first boat loads of visitors arriving on Friday and our first group of volunteers arriving on Saturday. It's great to have people on the island and to start getting to grips with our daily routine and we're slowly working out the logistics of getting people on and off the island with the unpredictable winds we've been having recently. 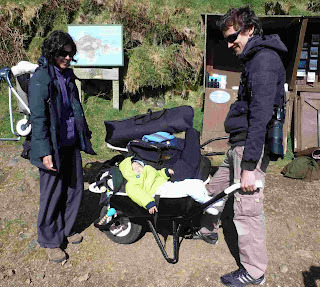 Our first group of volunteers were greeted by the news that the island tractor had broken down and we would have to use wheelbarrows to transport all their luggage up to the farm. Unfortunately this was not an April fools but they took it well and with everybody helping out we managed to get everything up in one trip and everyone was still smiling by the end of it! 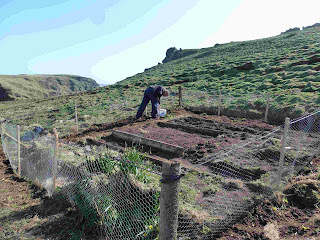 Since then the vols have been getting stuck in with lots of enthusiasm (despite the cold!) and have been helping us with all sort of things from greeting visitors to soil erosion surveys to spraying WD40 on every hinge on the island. 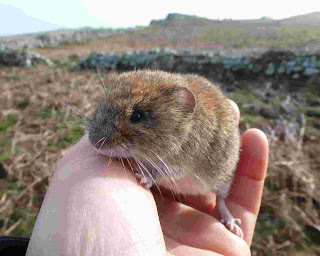 Some have even taken pity on the assistant warden who hasn't been shopping for a month and started feeding me leftovers! They've all been fantastic and I can't believe how much we've achieved since they arrived. 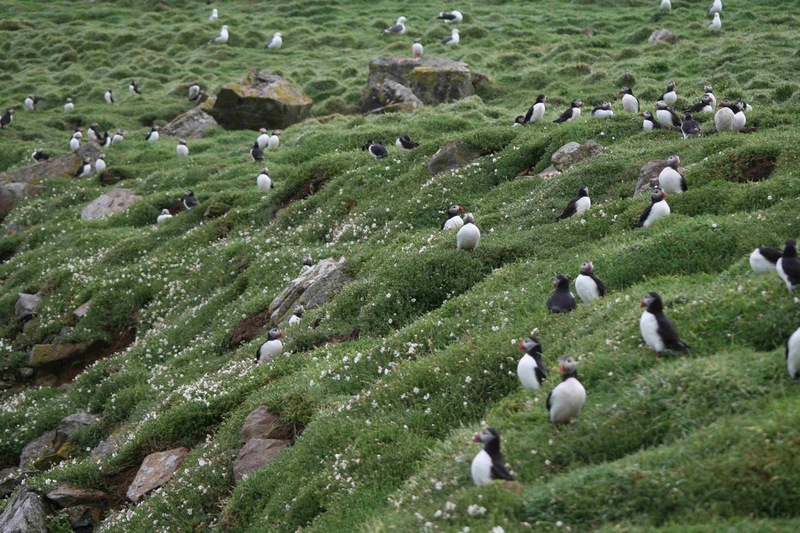 The auks have been absent from the cliffs for the last few days and it's been bitterly cold but there's still plenty going on. The ravens are taking young rabbits to feed their chicks and there have been lots of birds around including woodcock, lapwing, chiffchaffs, the first blackcaps of the season and two handsome male ring ouzels. 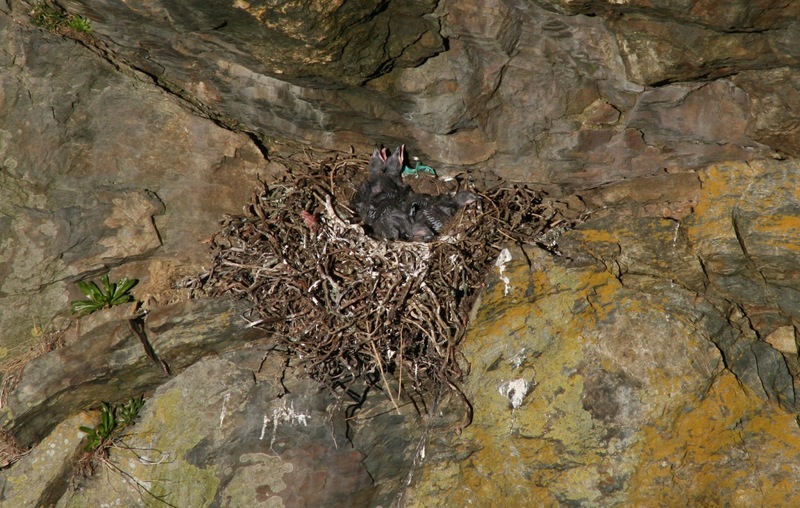 The Manx Shearwaters have arrived properly now and it feels like Skomer again when you can walk around at night and see them flying around your head and littering the ground. 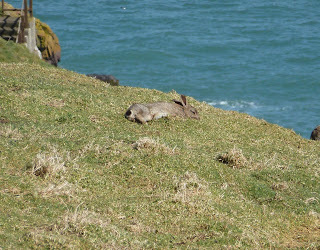 There was even one calling from a burrow while I was out watching chough yesterday. We've had a few days of glorious sunshine and we're all hoping for some warmer weather so that we don't have to wear five layers of clothing and I can stop going to Birdlog with a hot water bottle stuck up my jumper! 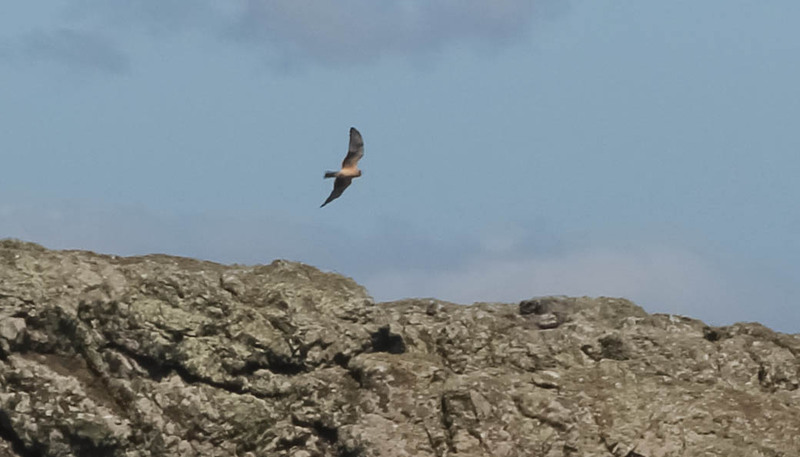 Looking at some strange photos of an unfamiliar raptor that was spotted by visitors and volunteers yesterday we realised that a bird new to Britain had briefly visited the island. The visitor who took the photograph said that all the Lesser Black-backed Gulls on the island seemed to get up and chase the bird until it was back over the sea when she was then able to take this record shot of it. 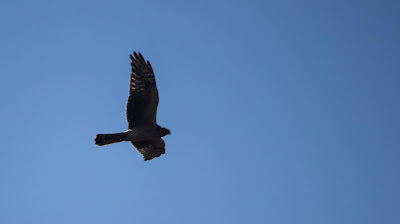 We identified it retrospectively as a Juvenile by its distinctive wing and tail shape and the mostly brown plumage. 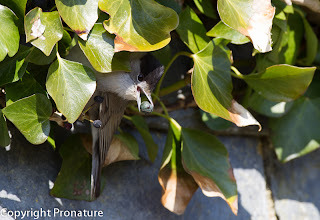 If anyone else saw the bird yesterday or today we would appreciate hearing about it. What an amazing sighting. In other news, we also discovered a secret tea factory operating in subterranean tunnels and caves deep within the islands core being run by dwarfs.